Tourism and Arts Minister Hon. Charles Banda has implored Zambians in the diaspora to take keen interest in the tourism sector as it provides opportunities for diasporic populations to invest in tourism facilities and open up new and untapped tourist destinations to wider audiences. The Minister is currently in Scotland attending the fourth Edinburgh International Culture Summit which brings together Culture Ministers, artists, thinkers and arts leaders from around the world to share ideas, expertise and best practice, with a view to inspiring positive change in cultural policy and investment. The Summit which is titled: Culture Connecting Peoples and Places will address three areas of cultural debate – Culture in a Networked World; Culture and Investment; Culture and Wellbeing. The summit includes 13 international youth delegates and 20 youth contributors participating in every aspect of the programme. 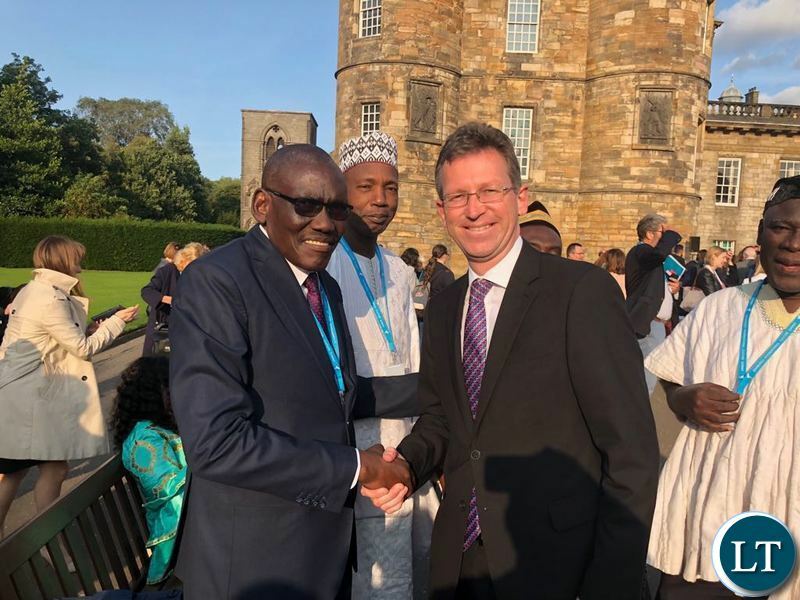 The Minister said the Edinburgh International Culture Summit is an important event because it will enable Zambia to connect with other people and places. And earlier on arrival, the Minister said tourism was an attractive and effective avenue for developing Zambia and called on all Zambians both home and away to be tourism marketing agents for the country. “We have a lot of work to do to place Zambia where it should be visible, and that visibility is not government’s responsibility alone, it is the responsibility of everyone who is a citizen of Zambia and belongs to the culture of Zambia. The Government is looking for people especially Zambians in the diaspora who can come back home and help us put up infrastructure in the hospitality industry. We need Hotels in Kasaba bay, in Kasama where we have the Chishimba Falls and Mbala where we have the Kalambo Falls,” he said. The Minister said if Zambians in the diaspora had capacity to put up Hotels in the hospitality industry, Government is going to assist them by giving them areas where they can invest because the conditions for investments were ripe for everyone who has the capacity to invest. “My appeal is that the diaspora must be there for us as our marketing agents. Zambians in United Kingdom must be in the forefront marketing Zambia in all aspects of our economic endeavors, which includes culture and tourism. It is incumbent upon the diaspora to take keen interest in what the Zambian government is doing to develop the tourism sector as an economic venture which will help in the economic development of the country,” he said. The Minister said tourism is no longer a Social Ministry but an Economic Ministry because of the potential that it has to generate resources and create jobs. “We have promised the people of Zambia employment, but it is not possible to give everyone white collar jobs, what we need to is to create an environment where people can utilize and develop their talent and be in the informal sector. President Lungu has directed everyone to contribute to the growth of Zambia no matter how little or how much one puts in, the aim is to ensure that we are lifting Zambia from the low levels of economic performance to high levels,” he said. The interest is there already. Not everyone will have the financial capacity to put up a hotel but it is good if there is a general guarantee to implement any developmental projects with full support from the government. Mushota from Scotland is on tour in Zambia. Nick has been grabed from her….. Better talk about agriculture. Not culture alone. “We need Hotels in Kasaba bay, in Kasama where we have the Chishimba Falls and Mbala where we have the Kalambo Falls,”. What of Sioma falls kwa Senanga?